This season, you may need to update your wardrobe but you won't have to cut or color your hair to recreate one of fall's hottest hair trends -- wet hair. 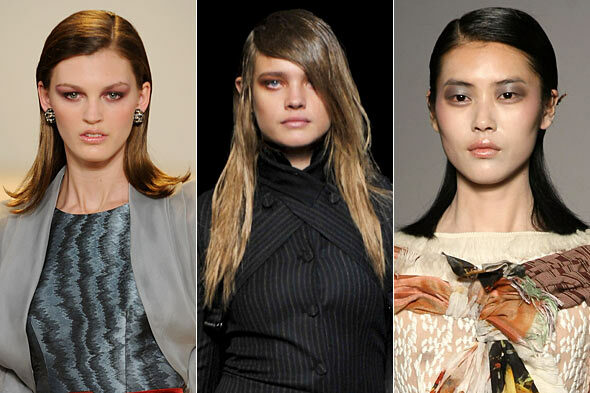 Slick hairstyles ruled the Fall 2010 runways of Carolina Herrera, Alexander Wang, andRodarte. And brunette beauties like Sandra Bullock, Megan Fox, and Lea Michele have all turned heads on the red carpet with glossily-gelled locks. "It's a popular trend this fall because of the way it perfectly complements the colors and cuts that we see," says Tippi Shorter, celebrity hairstylist and Avon global stylist adviser. "It's really shiny, sleek and sophisticated. The best thing about this new trend is it enhances what you already have." Ready to try out this sleek hair trend, StyleList tasked celebrity hairstylist George Ortiz to perfect these runway looks into a wearable hairstyle on a real woman -- namely, Wajmah Yaqubi. "The wet hair look is a fun and easy way to give change to your haircut," Ortiz says. "It also gives you the option to grow out bangs during that awkward, in-between stage. That's why it was so popular on the runway." Start by applying Advance Techniques Frizz Control Lotus Shield onto damp hair from root to tip and then blow dry strands straight with a detangling tool like the Advance Techniques Cushion Brush, recommends Shorter. Ortiz created a deep, side part and then used a 1-inch flat iron to remove any waves from the hair. Use a comb to guide the straightening iron through the sections of the hair. Tuck one side behind the ear and slick strands with a glossing cream or spray like Advance Techniques Mirror Shine Spray for a high-sheen finish. To transform your wet hair look into a simple updo to wear at night, Shorter advises pulling hair into a tight, sleek bun at the back of the neck to make the part really stand out. Secure the chignon with bobby pins and set with a light mist hairspray. Shop the selection of hairspray, gels, combs, and brushes below to help you perfect the wet hair trend, and check out our Wear the Beauty Trend column for more pretty looks to try.